Great Ski-O Plans, But Will it Snow? EMPO at the US Champs in "Combat Village"
After last year's continuation of the string low/no snow winters we've had, it is with a certain amount of trepidation that we approach the upcoming Ski-O season. Even though our US Champs event was a great success, it was very close to being canceled, and our two local events were a) canceled and b) held on thin, rutted, ice. Nonetheless, here we go. This year we start off sponsoring an event being put on in Old Forge by former Adirondack Orienteering Club members, and current US Champions, Scott Pleban and Sandy Stripp. This will be a two day affair, though you can attend just one. Check the announcement out on page 11 quickly, because the deadline for lower registration fees is December 8th. Closer to home, EMPO's two winter events will be held in Clifton Park at Kinns Road Park, and in Day at the Saratoga Biathlon Center. Both of these areas are on the smaller side, so the courses will be of the "Sprint" variety. The word "Sprint" is used to denote courses of less than "Classic" distance, so don't let yourself be put off by thinking you have to be some major athlete to participate in a "Sprint" event. In fact, because they are shorter, they make a good opportunity to give Ski-O a try, and quite possibly qualify for the ESG's on your first attempt. Obviously the quality of the events will depend somewhat upon the snow we have at the time (Day has somewhat more reliable snow), but both areas offer good trail networks which should make for fun skiing. Remember that it is especially important with Ski-O to check if the meet is still on, whenever the conditions are at all questionable. A decision to go ahead or to cancel is supposed to be made by 4 PM two days before the event. You can check with the Meet Director (listed on our schedule) or the ESG Hotline at 474-7944. Another event to note on the schedule is the second "Snowgaine" being hosted by CNYO. Last year, despite little snow anywhere else south of the Adirondacks, there was plenty of good skiing (or snowshoeing, or whatever) and some semi-adventurous fun to be had at this get together. So, check out the announcement printed elsewhere in this issue, and give it a thought as you plan your winter. This year's US Orienteering Championships were held in Quantico, Virginia, on the grounds of the US Marines base there. Don't let that give you the idea that the courses were set up through some nice open parade grounds, or among a bunch of barracks. In fact the maps used covered some large woods, with few trails, or other linear features. Compared to some other maps in that general area, there were many fewer spur & re-entrant sections; this also produced less climb, which, when combined with the open nature of the woods (not much green), made for fast times. That is, if you didn't make mistakes. There was plenty of opportunity for these to come into play, because there often were no large and obvious attack points; and if you once became unsure of your whereabouts, it could become extremely difficult to relocate. In some ways the area was like West Point, in that everyone was instructed that "if you see something that might be military 'ordnance' don't touch it; and watch out for stray concertina wire." As usual, I never saw any of either, which was good because I was gashed enough by some hanging bramble vines at a couple of points. But, as described above, the terrain is actually quite different from the rocks and mountains of West Point, and the Marines seem to do different things than the Cadets, as witnessed by the "Combat Village" and the foxholes. The "Combat Village" was next to the Day 2 Start and both Days' Finish areas, and was a group of seemingly bombed out buildings (it reminded me of my days working in the South Bronx) where the Marines practice house to house combat. It appeared on the left and right edges of the Day 1 ("Combat Village East") and Day 2 ("Combat Village West") maps, respectively. No controls were placed in it, and in fact we were all told to keep away (which was hard for the kids attending to live up to). The foxholes were ubiquitous, and were used for controls. Unfortunately, this also produced some problems, in that they were constantly moving. After the maps were produced, the Marines would keep digging new holes, fill in old ones, and generally do things to make them a somewhat less than reliable marker. In fact, the course setter had to literally re-dig one when he discovered late in the event preparations that a location he had set for a control no longer existed. In the end it all worked out, and certainly the difficulty I had with one foxhole had nothing to do with it not being there anymore. It was there; I just missed it. If you recall that particular weekend in November, it was miserable in the Northeast. Friday November 14th it snowed, sleeted, rained, and made travel difficult for anyone wanting to go anywhere. Some people who had registered for the event were not able to get there, particularly if they had been planning to fly. But five EMPO folks did manage to get out, and from about New York City on, the weather to the South was much better. By Saturday, Eastern Virginia was dry, if on the cool and breezy side. This held through Sunday, and the orienteering conditions were really pretty good: the trails were muddy, but the woods were surprisingly dry and conducive to fast running. The entire EMPO group made respectable showings, but I turned out to be the only one making a run at finishing in the top three. Unfortunately for me, I happen to be in a bracket with not only a many time former US Champion, but also the current World Champion (I knew there was a good reason I didn't bother driving to Minnesota for the Veterans World Cup). Peter Gagarin once again blew me and everyone else away, doing the courses in about 80% of the time it took the next best runner. Second place wasn't too closely contested either, but there was a good race for third, with several people no more than a few minutes behind the person who was in third after Day 1, which was I. I didn't have a perfect run, but I never missed. In comparing splits later, with other high finishers, my legs were never the fastest, but I never had one where I lost several minutes, and all the others (except Peter) did. I knew if I could avoid mistakes again on Day 2, I'd have a real shot at holding on to third; but I also didn't have enough of a lead to be extra cautious, so I'd have to take some risks. And, in the end, I got a bit too imprecise and missed the 8th control, a shallow re-entrant, overrunning it while looking for a landmark I never saw. I recovered fairly fast, but still lost probably about 2 minutes. Then, just to ice matters I missed the 10th control (the last one before the "GO" control) and even turned the wrong way after I had relocated, losing another 1 or 2 minutes. Thus I ended up in fourth by 1:21, losing to the former US Orienteering Team coach, Bob Turbyfill. Despite my misses, the per kilometer times were pretty good, well under 10 minutes per kilometer both days, showing how fast it was. And I think I can be fairly satisfied with finishing fourth out of thirty entries. But I guess I still have a few things to learn. Maybe I can study up enough over the winter. No, more likely I'll just start skiing (and ski-O-ing) and try to learn something new that way! We had a beautiful, sunny day for a change for our first event of the Fall season. The temperature was warm, but not too warm for running. The Five Rivers Environmental Center was obviously a great place to be, judging by the many other folks who chose to come there, even though they didn't orienteer (but several did ask us what we were doing, and seemed interested for the future). Because the map is old, in black & white, not too detailed, and fairly small, it's not possible to set a super-challenging course there; but it's such a nice spot that it makes a great beginner-through-intermediate location, and advanced orienteers can just try to run faster. A good number of folks turned up to give it a try, including several newcomers along with the usual more fervent "O" devotees. Everyone seemed to thoroughly enjoy themselves. There was one control placed a bit too far out along the trail, and the map's imprecision slowed a couple folks a bit. But despite all problems, everyone got through their course, and some were quite surprised by how quickly they completed them. The last couple times we've done a Meet here, the map has been modified and updated to show newly found or changed features. And there's even a whole newer section to the northeast that isn't on the map at all. If someone were looking for a chance to hone his or her mapping skills, this would be a great place to do it. In the meantime, we'll just have to make do with what we've got, and simply go out and have fun! Thanks to Anita Snachez of Five Rivers for her help in arrangements. And thanks to Glen Tryson and Phil H-T for picking up controls. About 55 people came to Grafton Lakes State Park to venture out into the woods on a nice Fall day (partly sunny and in the mid 50's). For a "local" meet, we had quite a broad geography represented with folks coming from Plattsburgh, New Paltz, Poughkeepsie, Utica, and Finland! (currently residing in Michigan and visiting in the area). Rather than conventional courses, eighteen controls were set out for a Score-O using Western Massachusetts Rules (find any 7, 11, 15 or all 18). People seemed to enjoy this format, although it was a bit confusing for some of those newer to orienteering. It was also easier on the course setter since fewer controls had to be placed and picked up. There was a little extra challenge for the course setter (and some anxiety) since small game and turkey were in season and hunting is allowed in parts of the park. Fortunately no unpleasant hunter-orienteer encounters occurred. The Park personnel were very helpful, providing us with hot water and even a nearby Port-a-potty. Thanks to them and all the others who helped out. EMPO held it's first (and so far only) MtBike-O at Thacher Park on Saturday, October 25th. Unfortunately it was a rotten day, with rain starting up the night before and continuing on until about the time we were scheduled to close registration (1 PM). As the result of a phone call the night before from two younger EMPO members who wanted to attend but had an exam on Saturday which didn't get out until 12:45, I had already agreed to keep things going until at least 2 PM. However, after a certain amount of planning, a couple hours or so of flag hanging, and eventually 4 hours of hanging around waiting for people to show up and register, I had a grand total of 5 entries. Fortunately I did get some company for much of my lonely vigil, as club Secretary John Beatty showed up, even though he wasn't going to bike the course. At one point he had asked me if he could just run it, or parts of it, for exercise, and I had discouraged him, out of concern for bikers/runners trying to be in the same place at the same time on the trails, which can be narrow and steep. As it turned out, this was a ludicrous concern, but you have to plan for success, not failure, or you fail from the start. So, John came by to help out with setup and registration on his way top go fishing, and ended up staying for about three hours, as we chatted about this, that, and everything else. I had originally figured that we would only get a few EMPO folks out, but that the bulk of the attendees would be from the Mohawk-Hudson Wheelmen bike club, which I had gotten at least marginally involved. The whole idea for the event had originally come out of their contacting another EMPO member, Eric Hamilton, about setting up a MtBike-O at a large scale event of theirs planned for 1999. I thought this might be a good entrée into getting a few of these folks exposed to the real fun of orienteering, plus I thought we needed some experience in this relatively new O discipline before we tried a large scale event, so I set up the meet at Thacher Park. I had quite a few bike folks say it sounded interesting, and they would try to be there, but I guess nobody thought it sounded interesting enough to brave a steady rain and fairly cold temperatures. In the end, exactly 0 people came from the bike club. This is somewhat in contrast to reports I have read from elsewhere, most recently Australia, where the turnout has tended to be about 2/3 bike people, 1/3 O people. Maybe it was my publicity (which was actually at its highest level ever). Maybe it was...well, I guess I just have to say it must have been the weather. But I hadn't figured the Mountain Bikers to be such weenies. All that aside, I think the few O folks who showed up actually had a good time, which goes a long way towards making me feel like I didn't completely waste my efforts. After John and I had hung out for an hour or so, Eric showed up, followed shortly by the first of his Clifton Park XC skiing proteges, Tom Temple. Eric has done a lot for O, XC, and the combination of the two, Ski-O, in his neck of the woods, and he nudged some of his young charges out to the event. After much futzing with gear, deciding upon appropriate clothing, and generally chatting about this and that, they headed out on the Long course (15k), about 10 minutes apart. By now John had more than done his duty, and he decided to venture on to try some fly casting in the Foxenkill, which flows right by our house. I offered our backyard, but he was going a bit further downstream (probably a good move; too many overhanging trees). Shortly thereafter Scott Pleban showed, (he had also called the day before to make sure it was still on). Scott is the US Ski-O Champ for the last several years, and someone I see fairly regularly at various events, as he lives up in Old Forge and tends to get to some of the same events we do (though we have yet to emulate his periodic trips to Europe for the major parts of the Ski-O season there; he does this truly on a shoestring budget, and I have a lot of respect for his commitment, and for his physical strength!). Not only did he take awhile to get ready, Scott actually wanted to spend awhile warming up before setting out on the course, so he road up and down the park road for 15 minutes or so before getting an official start, taking it as much to the letter of my "rules" as possible. He saw this right from the start as a Ski-O training opportunity, and that's pretty much how I had set it up. I'm not aware of any USOF (or IOF) rules on how one should conduct a MtBike-O. About all I could find was a Web site with material on a British variant called Trail-Quest. This appeared to be something more like Rogaine-on-a-Bike than orienteering (maybe a good, or even a better, idea, but it wouldn't fit in our park); but from that and one or two other things I got the idea that the distances ought to be around 15k for the Long, and less than that (10k? )for Medium and (5k?) Short courses. Happily, this fit pretty well with some Ski-O courses I had set on the same map a few years before, and I figured the route choice decisions should work in much the same way. At the same time, I also figured that there needed to be rules about what you could do with your bike or without it, and there I just copied the Ski-O rule: your bike must stay with you, whether you're on it or not. This was reinforced by the Park's prohibition against riding off the trails. Thus, you could bushwhack, but you had to push/carry/drag your bike rather than ride it whenever you chose to venture into the woods. For various reasons having to do with the way trails were (and weren't) shown on the map, I modified this slightly to allow riding in any Yellow (or shade of Yellow) area, but prohibit it in any White or Green area (there were no Green/Yellow combinations on the map). And you know, it all seemed to work. I had an amazing variety of route choices taken, considering I had only 5 competitors. There were 3 different routes taken to #1. On the major "To Bushwhack or Not to Bushwhack" choice, I had 3 go around and 2 go through. On what I thought was kind of a "Dead Leg", which I really only added to bring up the distance, I had a couple riders lose track of their position and miss the turn. Everybody loved it, including the slides and dumps on the tight switchback trail, the spray of mud on themselves (and especially when the kids passed their leader and sprayed mud on him!). Scott felt it was great Ski-O training. And in fact, the folks who came all turned out to be Ski-O people. Does this make MtBike-O a sub-genre of a sub-genre? Could be. Do we try to change this, and do what I had intended, which is interest cyclists in "real" orienteering; or do we celebrate this opportunity for Ski-O without snow, and maybe broaden orienteering's ultimate future? I don't have the answer, but I'm interested in the discussion. I know Scott and some others would love a summer MtBike-O series across New York next year (one or two days from each club). Personally, I think it fits quite nicely as a summer O alternative, and I may try our next MtBike event then. But before anyone takes my opinion on anything, I should probably make a few disclaimers: I don't own a mountain bike; I'm a "roadie" from way back before I ever orienteered; but I came to running-orienteering via Ski-orienteering, so I'm pretty weird anyway. Or so my family tells me. Thanks to Mike Krish and Nancy Engel of Thacher Park for their help in making arrangements for this event! 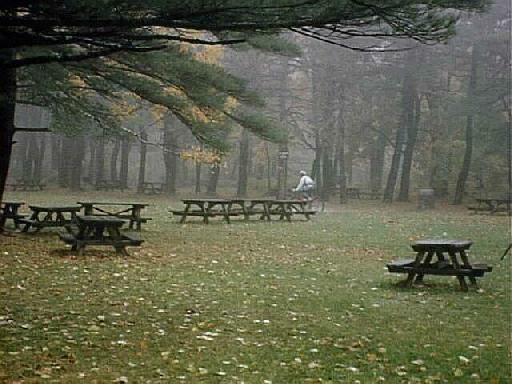 Scott Pleban heads out onto the MBO Long course at Thacher Park, through the rain, fog, and ghostly picnic tables. Once again, here are a couple of important basic ideas to have in mind for orienteering. This is one technique which orienteering draws directly from general land navigation and common map & compass skills. It is one that comes into play once you move off the trails and are trying at least Yellow level courses. On a White course you are always able to follow a trail, so there is no need to "aim" towards the Control or an attack point using your compass for much more than orienting your map. Once you're off the trails, you might use aiming off when you are heading towards a linear feature (such as a trail, stream or stonewall), and there is a particular point (such as a boulder, cairn, or rootstock) along that feature which you want to reach. If you try to go directly towards the boulder, and you come to the stream, but still don't see the boulder, you might not know which way to turn to be able to follow the stream to reach the boulder. But if you initially "aim off" to the right of the boulder, then when you reach the stream you know to turn left to follow it to the boulder. This is most useful when visibility isn't great and there aren't a lot of good ways to be sure you're holding a good bearing; or when you feel you'll be faster, as well as safer, by being less precise but running more all out. Some people find pace counting very useful and do it all the time; some find it distracting, a waste of mental energy, and never do it. So it's clearly not a necessity to count your paces if you want to succeed at orienteering. But it definitely is a good item to have in your repertoire of skills for at least some circumstances. Simply put, pace counting is keeping track of how many (double) steps you take, in order to determine how far you have gone. For this count to be useful you have to know how far you go with a number of double steps. You can try to measure this: take a jog, walk, run (at whatever speed you orienteer) at a local school track, or anywhere you know measures 100 meters fairly accurately. At your normal pace, count how many times your Right foot lands as you cover the distance. You can do it a few times to get an average, if you like more precision. Tthat number is the count you would then use to note each hundred meters you cover when you orienteer. A good initial estimate for many people is about 40 jog/run paces for 100 meters. You adjust that number if you're going uphill (more paces), tearing along a trail (fewer paces), getting tired (more paces), etc. My personal approach is to pace count primarily when I'm moving from an attack point in to the control. This keeps the numbers from getting too ridiculously large to keep track of, and allows me to think of other aspects of the race during longer and easier parts of a leg; but once I'm really looking for the control, it then helps me slow down and question what's happening if I don't see the flag within a certain distance. The fewer features there are to positively locate where I am on the map, the more likely it is I'll get some help from pace counting. Unless you're awfully good at "just knowing" the distance you've covered, give pace counting a try.